Sunflower Stamper: SUDSOL Blog Tour!! This was my post from the first ever SUDSOL blog tour. The links have been removed, but the benefits of SUDSOL remain for those of you who are demos! Click any of the links in the following post and take the 2 week free trial!!! I'm excited to be a part of the first tour!! SUDSOL has been a part of my stamping career since shortly after I joined SU! My upline was never close, and I'm honestly not sure if I even still have a direct above me?? So, when I want know something, I go to SUDSOL!!! Actually I don't have to go looking very often, the daily messages and samples keep me VERY informed!!! And then there's the website: the database is packed with forms and ideas to help your business; and the gallery has awesome samples, some exclusive to SUDSOL!! Our mission for the tour was to create demonstratable samples using items from the Summer Mini catalog. Here is what I came up with! Make sure you click each picture for a bigger view to see ALL the detail!! First, using the Elements of Style set. 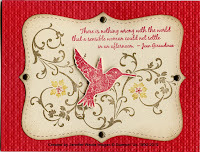 I started with a Real Red base and textured it with the Square Lattice embossing folder. Love that new folder!!! The Top Note was cut from Naturals Ivory cardstock. I first stamped the saying from Favorite Thoughts in Real Red near the top right. Next I added two swirls to fill in the rest of the space. Most of the swirl was inked with Soft Suede. I used a blender pen to remove the ink from the flower and used a Crushed Curry marker on the petals, and Real Red in the center. The hummingbird was stamped on another piece of Naturals Ivory, cut out and attached with dimensionals. The edge of the Top Note was sponged with Soft Suede and I added Vintage brads at each point on the Top Note. Next up is this creation using the Watercolor Trio set. One of my now favorite sets!!! Card base is Always Artichoke stamped with the taller branch image in Always Artichoke. 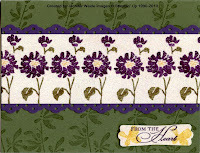 Elegant Eggplant layer that was punched on both the top and bottom edge with the Eyelet Border punch. Whisper White top layer was stamped repeatedly with the flower image. I inked the image using my markers: Elegant Eggplant, Always Artichoke & So Saffron. I also used the Stamp-a-ma-jig for even positioning. After the stamping, I put the whole strip down and inked it with Versamark, then poured Iridescent Ice embossing powder over it and heated. WOW-very pretty!! 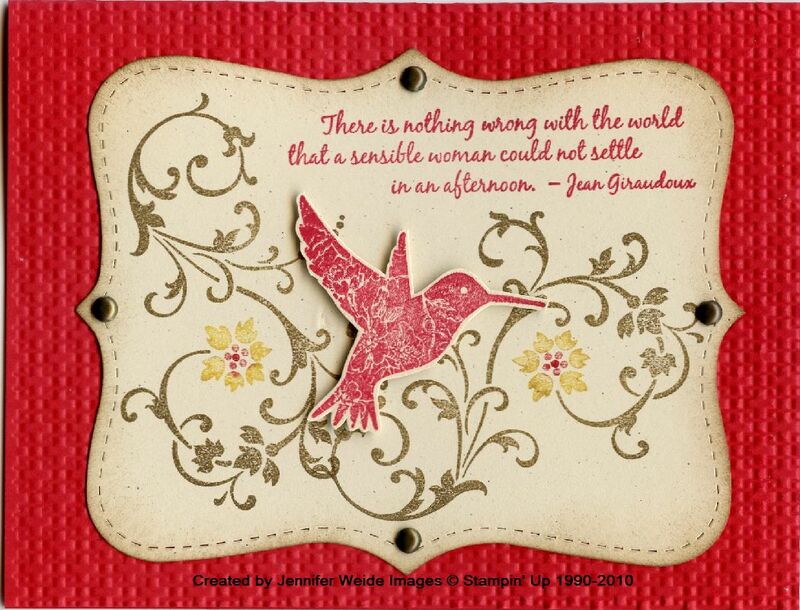 The saying was stamped on Whisper White and punched with the Modern label punch. Butterflies added in So Saffron. I also embossed this. Quick and easy technique to share with your stampers!!! 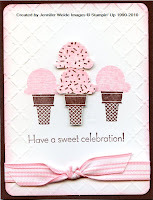 Last card creation is this one using the Sweet Scoops set. What a fun set!! Card base is Chocolate Chip, background is Whisper White textured with the Perfect Details plate using the craft frame to leave an untextured oval in the center. 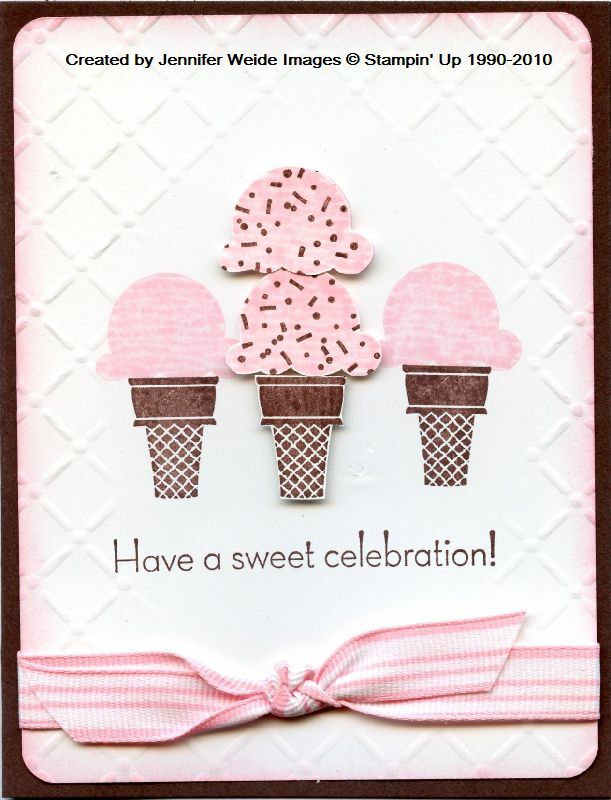 I stamped three sets of ice cream cones with Chocolate Chip & Pretty in Pink in the center. Actually I stamped the saying first, as far down as I could fit it, then did the cones just above it. I double stacked the center one. Also for the center cone & double stack I cut out a second image of each and attached with dimensionals for extra effect. The edges of the white layer were sponged with Pretty in Pink and a striped Pretty in Pink grosgrain ribbon is knotted around the bottom. 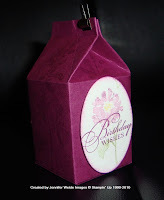 Lastly I did this 3D item-a Milk Carton. This die is still available for the Big Shot from the Occasions Mini. The Watercolor Trio set was perfect to use on it! The box was cut from Rich Razzleberry. The taller branch image was stamped on the box in Rich Razzleberry. 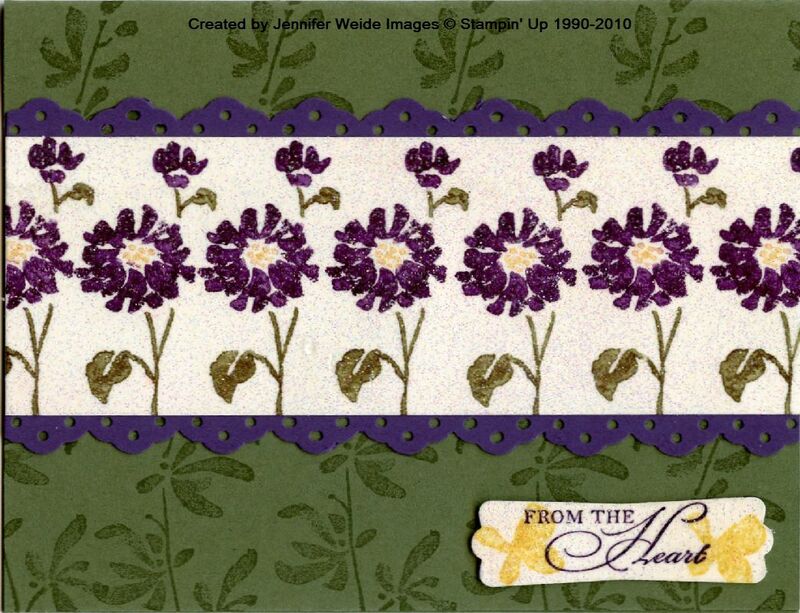 For the main image, I inked the flower stamp with Rich Razzleberry, Crushed Curry & Old Olive. But I stamped it off once before stamping on my cardstock so I got a very subtle image. Then I did the saying, Birthday Wishes in full strength. Punched with the Wide Oval and attached with dimensionals. Final accent, a Mini Library clip on to to hold it closed. That's it for me today. Are you ready to take the 2-week free trial?? Click here if so to sign up now!! I don't think you'll regret it!!! Remember the gallery I mentioned earlier?? Want to see what's in mine?? Click Here to take a peak, but of course only if you're a member!!! It has samples not seen anywhere else! I just completed a three month Design Team term with April so they are fairly recent samples too! Thanks for stopping by!! I hope to see you here again, & on SUDSOL very soon!!! Hi Jennifer! Love your projects! First Sweet Scoops sample I've seen. Thanks for making this tour such a great example of Sudsol quality! Wonderful job, Jennifer! My favorite it the Elements of Style card ... I just love what you did with that! I like them all but especially the sweet scoops. What fun ideas you have. Love, Love, Love your elements of style card! TFS! Oooh! How fun! I just LOVE that ice cream card. Great job! Very pretty cards! 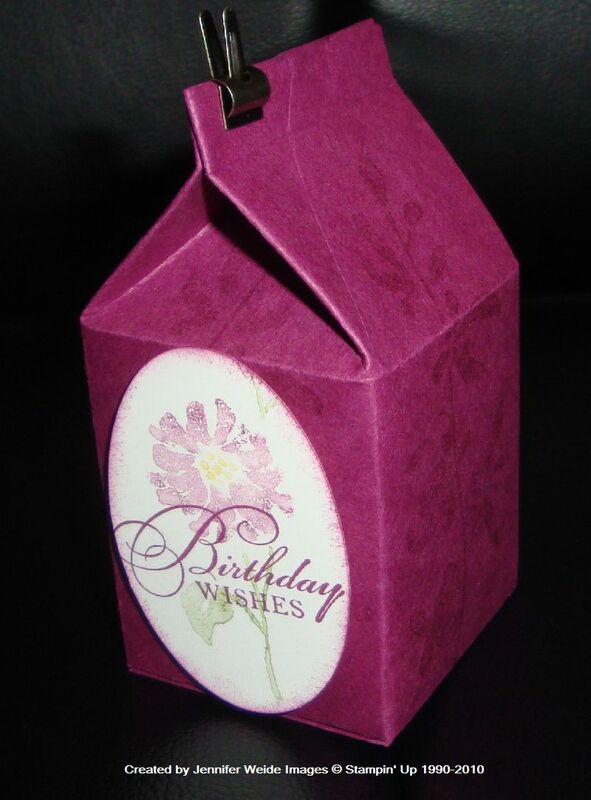 I really like how you decorated the mini milk carton too! I love your Elements of Style card. I have to get that set. But your ice cream card was the best, YUMMY. Sweet Scoops ... I had to run downstairs and get some ice cream! Thanks for sharing your great ideas Jennifer and for joining the Tour. The ice cream card is such fun! Love the ice cream cone project Jennifer. Beautiful showcase of Summer Mini products! Thanks for sharing and participating in the SUDSOL Blog Tour!